Good morning from sunny California! I don’t usually wear a lot of white in the fall/winter, but this season I’m all about getting out of my comfort zone and trying new styles, colors, etc (remember this post?). Today I’m wearing a DKNY drop waist dress in a pretty white with shimmery metallic threads running through it. There’s also a fun geometric print flowing across the dress. Super comfortable and a one-piece dress…perfect! I’m carrying my new 3.1. 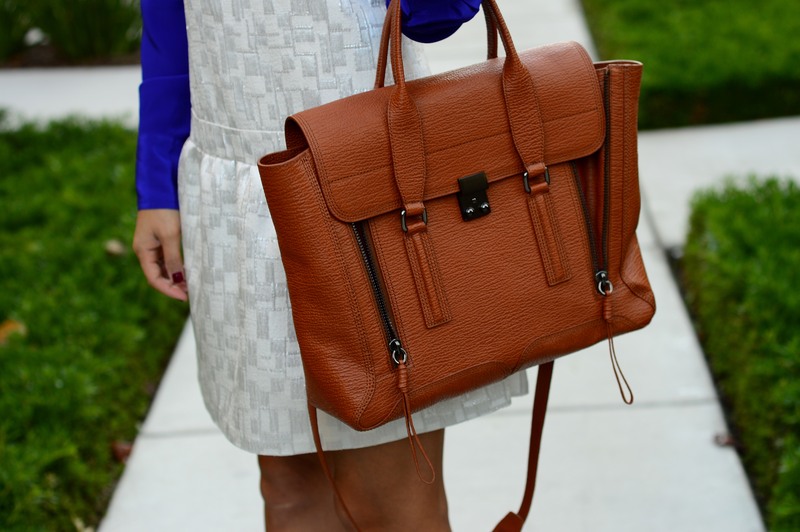 Phillip Lim Pashli satchel. I’ve been thinking about this purchase for a while now and decided to make the plunge after Shopbop had a sale. It’s a great work and play bag as it’s large enough for my laptop during the day, and in the evenings I can throw in a cardigan or coat for post-work dinners/drinks.